There wasn’t a game played in Lincoln on Saturday, which left a bad taste in many fans’ mouths after waiting all offseason to see coach Scott Frost lead his team into action. However, there was still a lot of recruiting going on behind the scenes. One prospect that was in attendance Saturday was Bishop Miege running back Brison Cobbins‍ from Shawnee, Kansas. 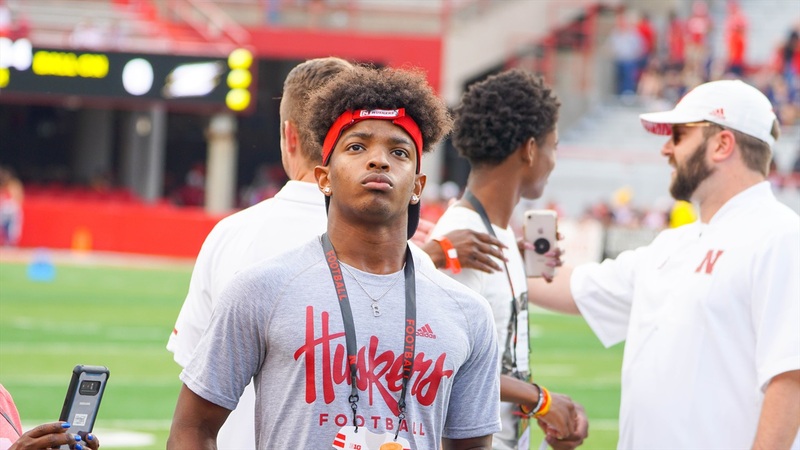 This was Cobbins’ third trip to Lincoln since Frost and his staff took over in Lincoln. He attended Junior Day, as well as a Friday Night Lights camp in June, where he ripped off a 4.4 40-yard dash. So, what did the speedster think of his experience in Lincoln before the storms rolled in? The junior running back has played one game so far this season. Last year, he ran for 1,282 yards and 17 touchdowns as a sophomore. Cobbins’ main recruiter is running backs coach Ryan Held and he also hears from director of high school relations Kenny Wilhite. Cobbins has good relationships with both coaches so far. Cobbins doesn’t have an offer from Nebraska yet, and Iowa State, Minnesota and Missouri also have his attention at this point. He does plan to make it back to Lincoln to see an actual game but needs to work out the dates. Another visit will mark his fourth trip to Lincoln since the spring. So, what is it that has him so drawn to Nebraska?